To greet you as family, not just a “dental patient.”To be gentle and kind in all actions.To maximize your health, comfort, and aesthetics. To be thankful and appreciate of you as our client. At Philadelphia Dentistry, we focus on aesthetic dentistry, restorative dentistry, general dentistry, and preventive care to provide you with comprehensive, customized, modern dental treatments. Our beautiful office has the most modern equipment, giving us the opportunity to provide you with dental services ranging from tooth-colored white fillings to porcelain veneers to porcelain crowns to Invisalign treatment. We want you to have the finest modern dental care available. At Philly Dentistry, we do our best to alleviate any of your concerns by explaining all procedures and options before treatment begins. We work to educate each of our patients so you feel like you are making the very best decisions about your oral health, whether you need a cavity filled or want a complete smile makeover. Cosmetic Dentistry: How your teeth look is just as important as how your teeth work. Through treatments like tooth whitening and bleaching, porcelain veneers, and Cerinate Lumineers make it possible for you to quickly and easily get a flawless, celeb-worthy smile. You can have whiter teeth and teeth that complement your skin tone and face shape. Get rid of the short teeth, gummy smile, crooked teeth, chips, and stains with versatile and long-lasting cosmetic dentistry treatments. Family and Pediatric Dentistry: Good oral health begins at a young age. It’s up to parents to set a good example for their children when it comes to oral health. Introduce your children to a patient and gentle Philadelphia pediatric dental practice. We take care of all the members of your family with thorough preventive care, including professional cleanings, exams, low-radiation x-rays, dental sealants, fluoride treatments, and treatment for TMJ. Invisalign: For patients who have always longed for straight teeth but not the metal mouth that accompanies such a goal, there is Invisalign. This innovative orthodontic treatment allows you to align your teeth completely under the radar. Moving just a few teeth at a time, Invisalign slowly moves your smile into place so it is straight, comfortable, and beautiful. Dr. Cirka is an Elite Invisalign Provider, highly experienced in creating new smiles for his Philadelphia patients. Restorative Dentistry: Restorative dentistry procedures are all about rebuilding the functionality of your teeth. If you are constantly concerned about the stability of your dentures, unreliable loose teeth, bleeding gums, or other oral health problems, restorations give you back a healthy and working smile. Not only will you be able to smile confidently again with solutions like dental crowns, dental bridges and dental implants, you will be able to speak and eat confidently too. Our dental services are offered at affordable fees and payment plans. Throughout our website, you will find that we are transparent about the costs of treatment at our office. We want you to know what to expect even before you seek us out for a consultation. 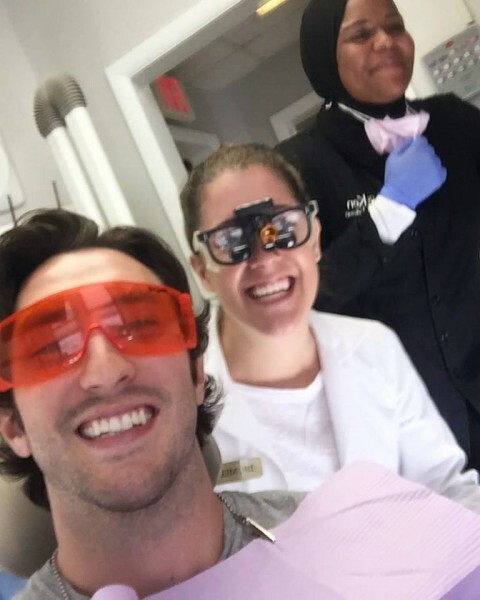 We strive to be straightforward about all fees and manner of care at our Philadelphia dental office so that you can trust that you are in good hands from start to finish, whether you are getting a dental cleaning or undergoing a full smile makeover. In addition to advanced instrument sterilization as recommended by the American Dental Association and the Center for Disease Control, at Philly Dentistry we utilize the service of an outside organization that monitors the effectiveness of our sterilizers. We strictly observe all Occupational Safety and Health Administration (OSHA) guidelines. We are HIPAA compliant and fully protect your personal information. If you are seeking Philadelphia area dental practice that listens to its patients and puts you first, call our Philadelphia dental office today to find out how cosmetic dentistry can benefit your smile (215) 866-1800.